Carnival isn’t alone in their poor treatment of ship employees, but its immense market cap argues that it could afford to not be so stingy and callous. The cruise ship Arcadia will take pride of place in festivities to commemorate 175 years of P&O shipping on Tuesday, with royalty in attendance and the Red Arrows saluting overhead. But as the P&O Cruises fleet sails from Southampton, the Arcadia will be without the Indian restaurant crew who were serving British passengers this time last year. For daring to protest for little over an hour at their falling, meagre earnings – and despite the assurances of the ship’s captain and P&O’s British head office – the careers of about 150 people have been quietly, summarily ended. Signs of trouble had been growing on the P&O fleet for years amid passenger complaints at falling standards. But such irritations had a more serious downside for crew members, whose livelihood depends on the goodwill of the clientele. With basic wages of as little as 75p an hour, tips make up the bulk of earnings – and these were drying up. In late 2010 P&O Cruises had agreed to review procedures, to instigate more auto-tipping, and underwrite the crew’s precarious wages. But by the middle of 2011 nothing had been done. The Arcadia was on a 72-day cruise from Southampton to Alaska via the Panama canal and back. A number of passengers were booked only until San Francisco, where they disembarked to fly home. And, again, the expected tips from departing passengers failed to materialise. With the Arcadia in port in Seattle, about 150 of the lowest paid decided to protest. Before that evening’s meal, the waiters gathered on the dockside. The demonstration inconvenienced some passengers, who had to wait for their usual table at the Arcadia’s Meridian restaurant or dine earlier at the ship’s Belvedere food court. Fewer than usual made it to the cabaret that night. But as one passenger blogged, the overall atmosphere was good. Before the 90 minutes were up, the good-humoured protest was over. The ship’s British captain, Kevin Oprey, had spoken to the Southampton head office to relay the kitchen staff’s concerns. The waiters then returned to work, labouring late into the night, and were assured there would be no recriminations or sanctions. While most onboard assumed the matter had been amicably laid to rest, a different decision was being taken in the head offices of P&O’s owner, Carnival. This protest could not, directors decided, be tolerated – no matter what assurances the captain had given the crew. The crew completed their contracts – typically six to nine months at sea, at least 14 hours’ work a day, every day – and returned to their homes and families in India, expecting to get the call as usual to rejoin the ship. Just before Christmas last year, the letters arrived. Carnival had, they stated, listened to crew. They were talking through the options for a “more guaranteed remuneration package at some point in the future”. They were “working on a project to address the issues”. As the Guardian reported in April, this new remuneration package would raise the lowest rate of basic pay to £250 a month. Additional bonuses, replacing tips, could be withheld from crew who failed to achieve satisfaction ratings of 92%. No waiter who took part in the protest would be re-engaged on any Carnival UK ship. Neither would they be offered any future contract by their employers, the Mumbai recruitment agency Fleet Maritime Service International. Enclosed was a letter from Fleet which added: “We have been provided with details regarding the situation from Carnival UK advising that they do not wish to re-engage you on a ship.” It said that, “after careful consideration, we agree”. Fleet’s employees are not protected by British law: the letters of effective dismissal list only the address of its registered office in Bermuda, a favoured flag of convenience for ships based in ports far away. The Fleet payroll office is in the tax haven of Guernsey. Yet the letter is signed by an Edward Jones, the chief financial officer of Carnival UK. 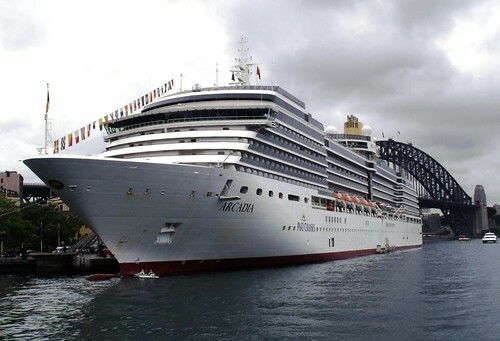 A spokeswoman for P&O said on Sunday: “The withdrawal of labour, which was undertaken by some of Arcadia’s restaurant team on May 10 2011, was without warning, ‘unofficial’ and greatly impacted our customers. At the time the captain committed that no disciplinary action would be taken. As a result all crew were allowed to complete their current contracts. Fleet is the largest employer of cruise ship personnel in India, and Carnival runs half of the world cruise market. Historic connections mean Indian crew largely find work on the British ships Carnival controls. Ship workers often send the bulk of their pay packets to support families at home.